Nikolay Ivanovich Vavilov is a scientist-geneticist, botanist, breeder, geographer, academician of the USSR Academy of Sciences, of the Ukrainian Soviet Socialist Republic Academy of Sciences and of the All-Union Academy of Agricultural Sciences. Vavilov is the founder of the doctrine on the immunity of plants, on the centers of origin of cultivated plants as well as on species like a system. In 1930-1940 he was the president of the All-Soviet Union Geographical Society, the founder of the All-Soviet Union of the Institute of plant industry, the director of the Institute of genetics of the USSR Academy of Sciences. The post card with an original stamp depicts the portrait of N.I. 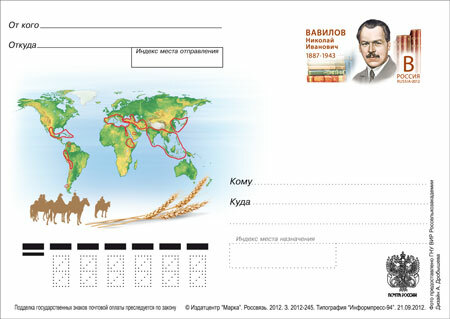 Vavilov, the map of origin of cultivated plants, the ears of wheat – the main studied species of cereals.